Most locals will be surprised at my choice for best starting hole in Bangkok. Admittedly the Vintage Club’s 1st hole isn’t a spectacular golf hole, but what appeals is it’s a relatively easy starting hole that will only punish you if you hit an extremely errant shot. Most golf travelers have probably never even heard of the Vintage club, as it is not on the typical playing circuit or any Bangkok golf package that I have ever seen advertised, it should be! The 1st hole at the Vintage Club is a modest 357 yards from the back tees, 333 yards from the tees most people play. The only real trouble off the tee is an OB concrete wall, but in order to hit it over here you would need to hit at least 200 yards at 45 degree angle. There is a grouping of trees on the right side and even if you do hit in here the chances are you will have some kind of shot. For hookers, the 18th fairway will catch your duck hooks. Most players will be hitting a short or middle iron into this green at most. A bunker guards the left side and it is actually not the easiest green to get it close as the green tilts from front to back. With a front pin location, you need to land the ball short of the green to get it close, even with a wedge in your hand. For most golfers, an easy beginning hole can only led to a good score and it promotes confidence for the rest of the round. The Vintage Club is a great course for beginners and high handicappers, and the first hole ensures there are very few delays in tee times. The smart play is to hit 3 wood or even a hybrid off the tee, aim for the left red 100 yard stake. This will leave you a full shot into the green. 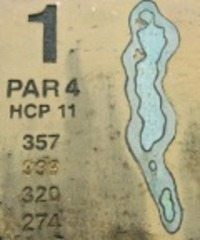 A nice touch out at The Vintage Club is they have daily pin placements stapled on the back of the scorecards, so take the time to look at those before selecting your club. You’ll often find you need to hit one club more or less than the yardage from the fairway markers. A bogey at worst will be on your scorecard unless you hit it OB off tee or blade your approach shot over the green into the water, however only the worst of worse shots will cause you trouble on this pleasant starting hole. Have a great round indeed at this lesser known course just South East of Bangkok on the way to Pattaya. If you have any Vintage Golf Club playing experiences or personal easiest holes stories do leave a comment here or if you prefer send me an email at my Thailand golf vacation company. Thailand Golf Tee Boxes: Which One and Where is Best?